Aaron Eckhart rarely plays vulnerable men. His chiseled looks and cocky smirk have led him to roles as an unrepentant bully (In The Company Of Men), a confident leader (Any Given Sunday), a sleazy husband (Nurse Betty), a smooth-tongued company man (Thank You For Smoking), a swaggering chef (No Reservations), and a darkly tortured politico (The Dark Knight), among other things. But in John Cameron Mitchell’s Rabbit Hole, he stars as a father grappling with his 4-year-old son’s death. Struggling with anger, guilt, and despair, he tries to salvage his marriage to emotionally paralyzed spouse Nicole Kidman. Their complicated grief unfurls at a patient pace. An antidote to other, more extreme awards-season dramas like Black Swan, the quiet, thoughtful Rabbit Hole—based on David Lindsay-Abaire’s Tony Award- and Pulitzer Prize-winning play—has earned Eckhart accolades for smoothly stepping out of his perceived comfort zone. The A.V. Club recently caught up with Eckhart to discuss his career ambitions highbrow and low. The A.V. Club: Did you see Rabbit Hole onstage before taking on this role? 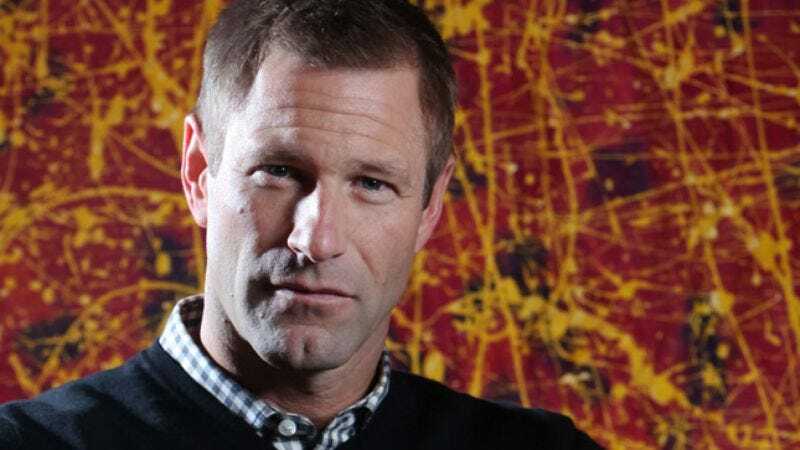 Aaron Eckhart: No, I came into this thing ignorant. I had been making movies and living under a rock. So I literally went from The Rum Diary, which I was filming with Johnny Depp in Puerto Rico, to rehearsal the next day—and was filming the next week. AVC: Did John Cameron Mitchell ask you to play this character in an understated way? AE: I like to overact everything, so—that was a joke. This movie could’ve easily slipped into melodrama. And we were all very cognizant of that, and talked about it, “How can we make it so it’s real?” It was the little things: the silences, the moving around in each other’s spaces. And Nicole and I agreed with each other that we would let each other into our spaces intimately. Whatever it was, we were gonna do it real. And I think we pulled it off. AVC: There’s also this sly humor in the movie, which comes as a surprise. AE: It’s like if you pinch an envelope in one place, it’s going to expand in another. Human beings are engineered to laugh, no matter what the circumstances, if they’re dire or tragic. You always hear about people breaking up hysterically at funerals. We thought that was a very important part of the film. You know, getting stoned in the group session, I think, is believable. The audience needs that release. You need to chill a little bit. AVC: Was this role a challenge? AE: Gosh, I tell you what was challenging: being so restrained in circumstances in which I would normally go off. I would challenge and question; I’d be more aggressive in getting an answer out of somebody. If [my character] Howie were too weak, I probably wouldn’t have done it. But I felt like he stood up for what he believed in. He had a value system. AVC: Have you ever experienced that sort of grief in real life? AE: Oh my God, no. No, no, no, no, no. And I don’t have any children, so I could only imagine. AVC: Were you as intrigued by how different a project this was for John Cameron Mitchell? AE: Yeah! He had a similar experience; he lost a brother when he was a child. I truly believe as an actor that I can do anything, and I believe the same for directors. I don’t pigeonhole directors as much as I think the public does. I just feel like as a creative person, you can do anything. I believe in actors who become directors. John, from his other films, obviously can tell a story wonderfully. It’s just another phase or transition for him. AVC: He’s been quoted as saying he had a really hilarious relationship with you. AE: We’re dealing with some pretty dark material. I think we found humor in any point we possibly could. Just saying audacious and weird things, saying the exact opposite of what the right thing is at the time. Oh God—I gotta write this crap down when it happens. AVC: What would you like your next step to be? AE: I wanna do a spy movie now—like a real spy movie. I’d love to do a sort of Cold War spy movie. That’s what I’m looking to do now. AVC: In an interview with People, Nicole Kidman said she begged you to take the part. What exactly did she do? AE: I think it was more, “Hey, do you wanna do this?” And I said, “Yeah, I’ll do it!” She called me up and explained to me her passion for the project. I’ve always been impressed with her taste in material, how she challenges herself—and even more so now. AVC: Where Rabbit Hole is deeply emotional, your next film, the alien-invasion action film Battle: Los Angeles, is deeply physical. What was training for that like? AE: I went through boot camp. I love that crap 100 percent. I loooove. All the actors ate, slept, showered together. We all did the thing where we were in character all day. It was great. AVC: Do you emerge out of something like that feeling like a badass? AE: Absolutely. When you see this movie, you’re gonna see a bunch of badasses. Whenever I see a movie like Black Hawk Down or whatever, I’m like, “Dammit! Why wasn’t I in that movie?” I love playing those characters. AVC: And yet growing up, you wanted to be a musician. AE: I wanted to be a songwriter. I play guitar very poorly. But I felt like I had a certain je nais se quoi with the words. So really, I wanted to be a lyricist-songwriter. I wrote all the way through high school. I was absolutely obsessed with it. But I just felt that it was too personal for me. It was too scary for me to be a songwriter. AVC: When you work out for a role like Battle: Los Angeles, what are you listening to? AE: That was a joke. No, I’m absolutely not heartbroken. I’m a huge Chris Nolan fan, and I’m honored that he had me in one. And I’m doubly honored that I was able to share some time with Heath [Ledger] and watch him work. So I think the natural progression is that it goes on. I have absolutely no misgivings about not being in it. AVC: But are you heartbroken that you might not be guaranteed another San Diego Comic Con visit, coming face-to-face with people dressed as your character? AE: Oh, I just went to Comic Con! I’ll always make movies that go to Comic Con. I had a concussion at the last Comic Con. I was in a daze the whole time, and I found out that I had been concussed because I got hit by a car on my bicycle. That is pretty badass, too. Getting hit by a car is not for wimps. But Comic Con is cool. I went to the Scream Awards, too. I’m down with it. I’m, you know… I’m a playa. AVC: Your first role ever was as a nerd—as Charlie Brown in a school play. What’s the key to playing Charlie Brown? AE: Yes! Charlie—it was really his wardrobe. My mother made the sweater with the squiggly line on it. And after that, I embodied… [Laughs.] I was 14. Let’s see, the key to Charlie Brown was his sort of self-doubt. That’s the way into Charlie Brown: his well-meaning clumsiness. AVC: Is there any footage of this? AE: No, because this was before—See? You probably don’t know that—this was before they invented the video camera. [Laughs.] Could you imagine such a time?